I am surrounded by papers. They keep coming every day. I bring them home. My wife brings them home. The postal carrier brings them to to my mailbox every day. Something must be done! So begins my paperless initiative. I decided there had to be a better way. I am an intelligent human being. I own tools that should be able to handle my problem, i.e. Mac, multi-purpose printer with flatbed scanner and an iPad. Surely others have faced this issue. I researched Google, read blogs and found resources to solve my problem. The single best resource I found was an iBooks iAuthor created book available on the Apple iBooks Store called Paperless by David Sparks. You may love your old fashioned paper books, but Paperless is the perfect argument for electronic multimedia books. 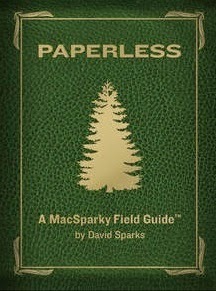 In the book David Sparks explains everything you need to know to move to a paperless office. He includes screencasts (short movie demonstrations), pop up photograph galleries, and links to outside web resources. In fact the book includes 1.5 hours of video! Paperless was selected as one of the “Best of 2012” by the iBooks Store and is available for $9.99. Paperless is the first book in the MacSparky Field Guides Series so if you like it there are other topics that you can read about in the same media-rich format. You can also follow David Sparks and read more about his process at www.macsparky.com and he also co-hosts a podacast called Mac Power Users which you can find at www.macpowerusers.com . After reading Paperless, I have begun my process of moving to a paperless life. In upcoming posts I will share with you the steps I have taken in my personal quest to rid my life of paper.